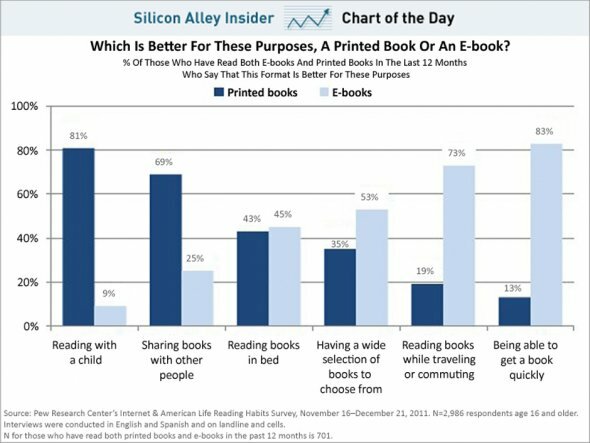 This “Business Insider” chart of the day shows eBooks clobbering paper books for personal uses, but not for shared uses. The big transition will come, in our view, when schools rely substantially on tablet computers and eBooks for academics. That will make the generational shift solid as a rock. This entry was posted on Friday, April 6th, 2012 at 6:23 PM and is filed under Interesting Charts. You can follow any responses to this entry through the RSS 2.0 feed. Both comments and pings are currently closed.